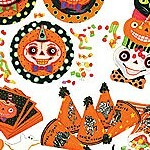 Whimsical items for Halloween TRICK or TREAT: pails, bags and special treats! 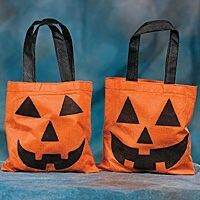 Whimsical items for TRICK or TREAT: pails, bags and special treats! Safety first! Make trick-or-treaters more visible by outfitting them with glow necklaces or light up wands and other Safety gear. Get together with neighbors and friends to host a Halloween block party in lieu of trick-or-treating. Keep kids close! Why not giving your little kids pre-filled pails in the safety of your home? Organize a treasure hunt and other activities and keep them at home. Want a variety of non-candy goodies to give away? Try the affordable variety of our Halloween novelty assortment. Make sure trick-or-treating guests have a well lit path to approach your home with outdoor lights and lanterns. Light up their night!